Paramedics don't always arrive in an ambulance. In crowds, there are times two wheels can be the fastest way to help a person in trouble. 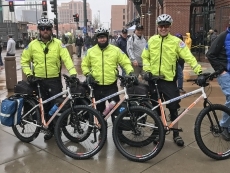 Since 1989, Denver Paramedics has had a Bike Team. "We were the first official EMS Bike Team in the country," said Operations Manager with Denver Health, Kyle Roodberg.